Kendra Wenzel of Portland, Oregon is a “lifer” in the sport of cycling. She started racing during college in Davis, CA in the mid-1980s at age 18, racing nationally and internationally for a total of 12+ years, primarily on the road and track. Highlights include a gold medal at the Pan Am Games, a 4th at the Goodwill Games, and 6th at the World Championships in the Individual Pursuit. As a student at UC Berkeley, she won the National Collegiate Road Championship in 1994. Later as a part of Team Saeco, she won silver in 1998 and bronze in 1999 at the Elite National Road Race Championships. She participated in the World Championship Road Race in 1997 and 1998. 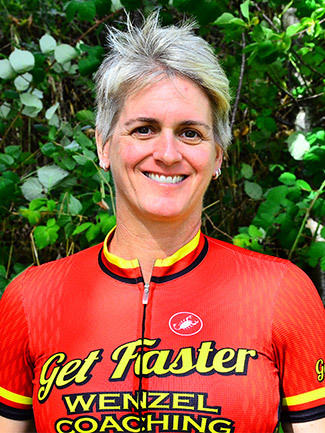 Kendra transitioned to coaching in the late 1990s, writing training articles for Velonews and working with a variety of racers, including the 2013 Women’s US Pro Road and Individual Pursuit Champion. She’s been coaching for nearly 25 years now with her business Wenzel Coaching, which has about 35 active cycling coaches around the country. Kendra co-authored the book Bike Racing 101 in 2003. Kendra served as the female athlete representative on the USCF Board of Trustees and USA Cycling Road Committee from 2008 to 2015, taking part in the Women’s Committee there as well. In the promoter realm, she worked as the pro road race director at the Sea Otter Classic from 2004 to 2011, and has been a part of crews on the National Road Championships and gran fondos such as the Tour de Hood and USBHOF Gran Fondo. She has been on the on the US Bicycling Hall of Fame nomination committee since 2014. She also serves as the chair of the Oregon Bicycle Racing Association (OBRA) Women’s Committee, which was formed to help grow women’s cycling and racing in Oregon. Kendra enjoys helping all levels of riders improve their training and skills and learn to ride more confidently.